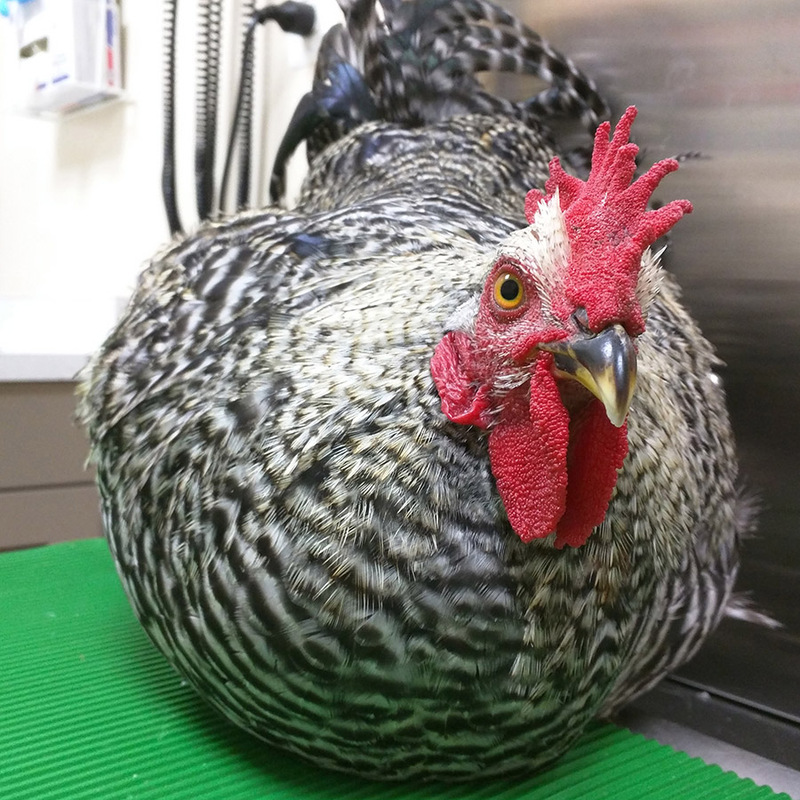 Checkers is a 7-month-old Barred Plymouth Rock Rooster who had his foot accidentally stepped on by a horse. 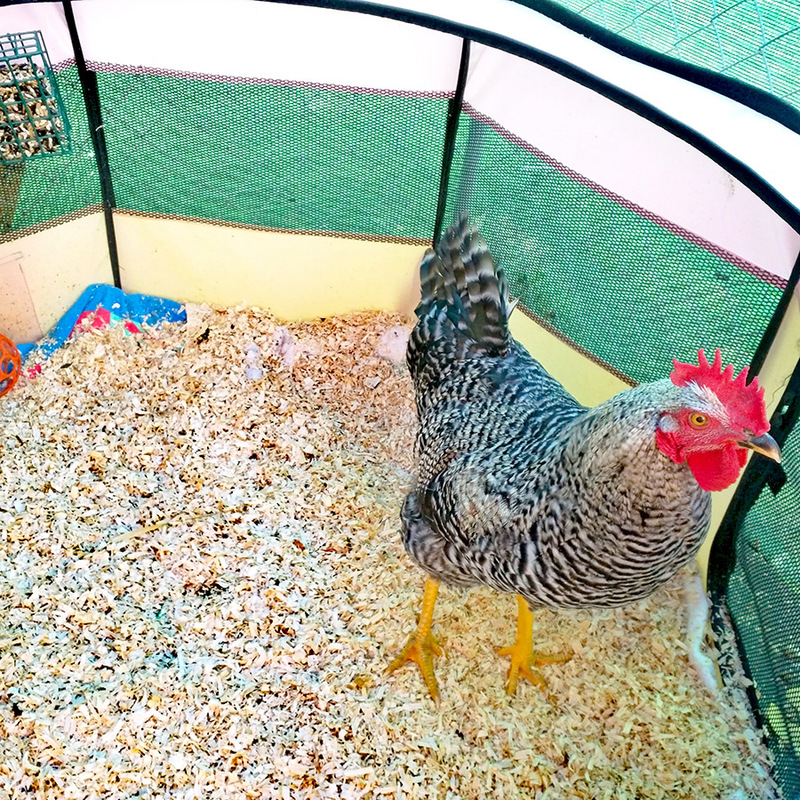 He and his brother, General Zod, were new additions to Kelly’s ‘Rooster Run’--- a second enclosure she built to take in any roosters in the area which needed a home. 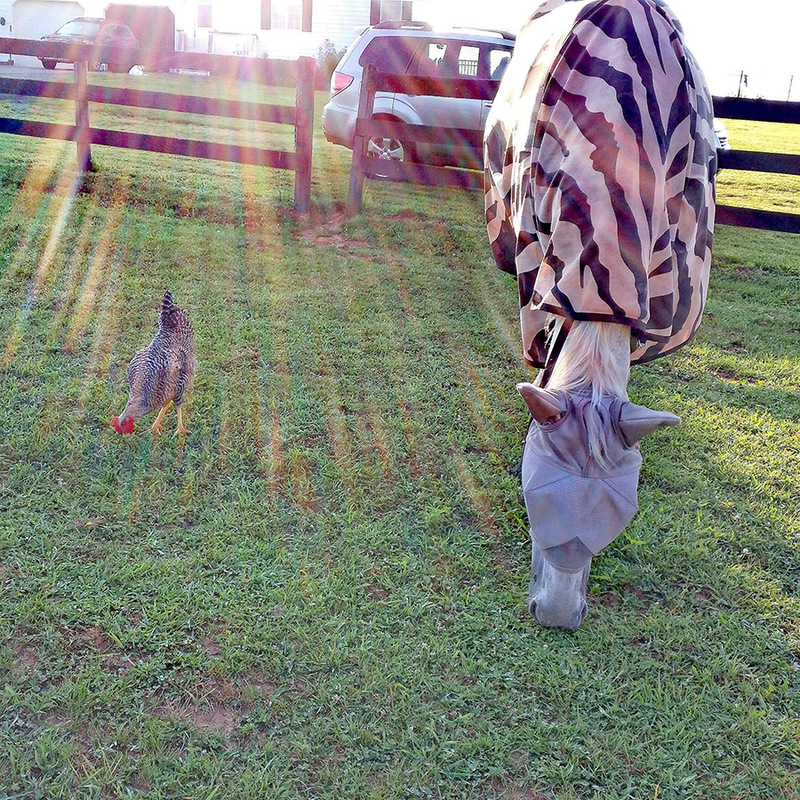 Both the rooster run, and the original run were situated inside the pasture where she boards her horse, Cash. 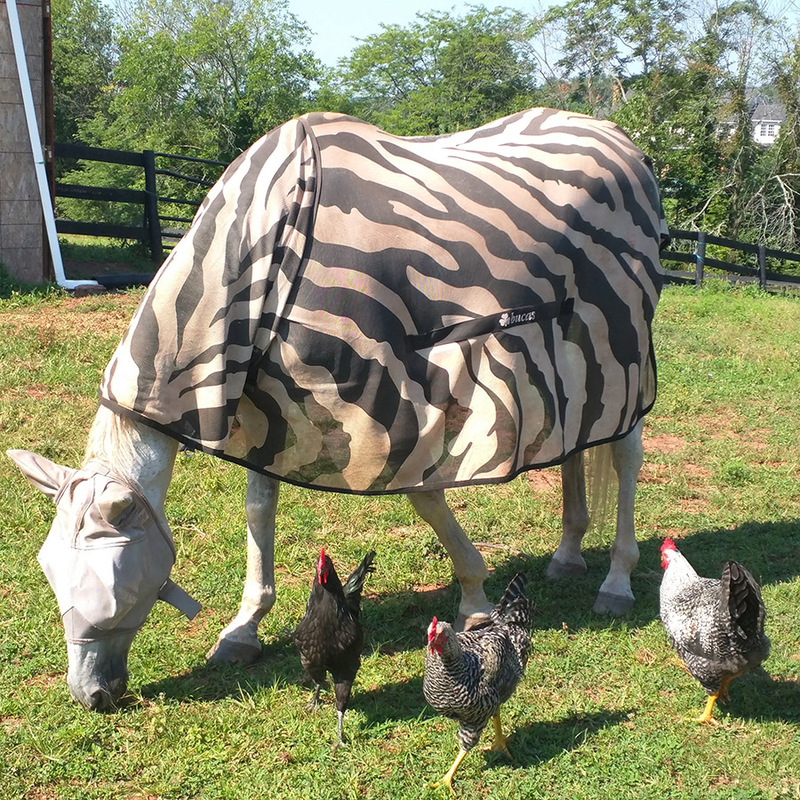 Cash is a very sweet, older horse who has always been known for being very kind and gentle to smaller animals. Because of his gentle nature, Kelly never thought there would be a problem with the chickens grazing near him while she let them out of their enclosures for their daily free ranging session. 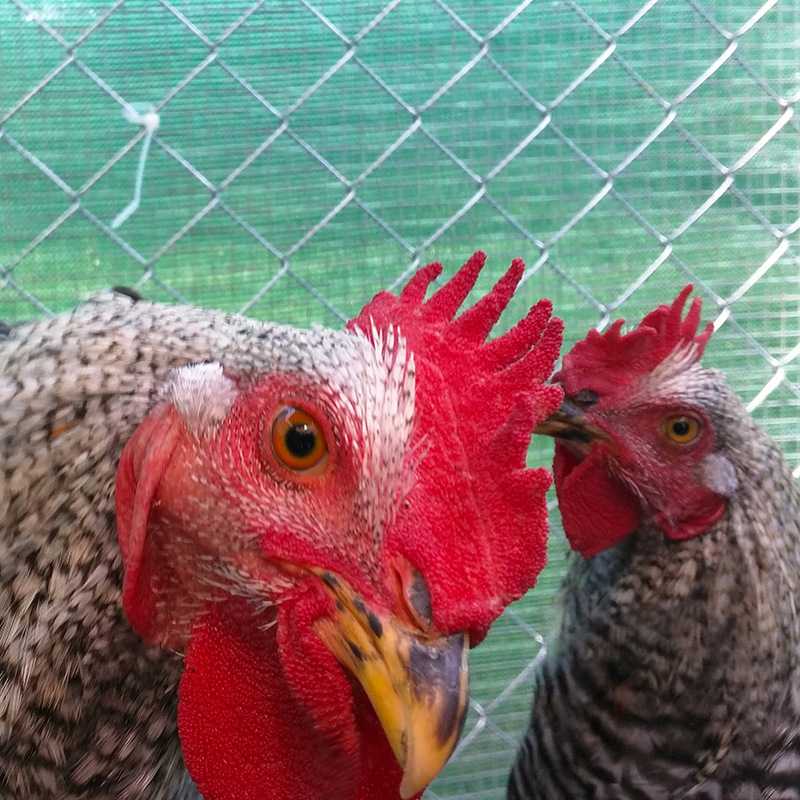 The newest roosters in the flock tended to gravitate towards Cash, and they frequently grazed together. 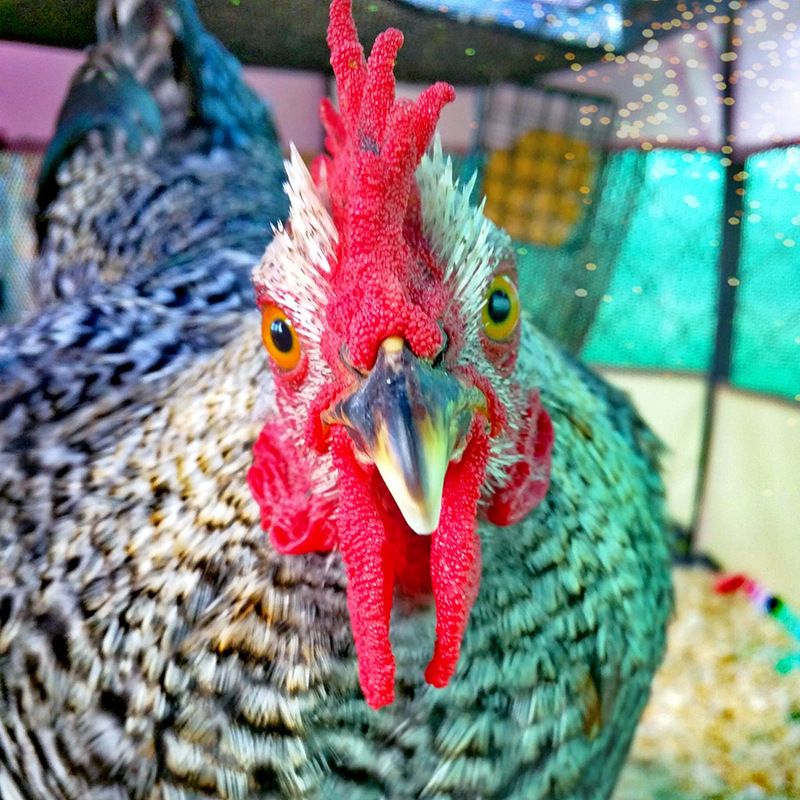 All of a sudden, she heard a loud distress scream from one of the chickens and noticed Checkers was limping. She quickly scooped him up in her arms and looked at his foot. Other than a minor scrape, there was no obvious external damage and nothing was bleeding. 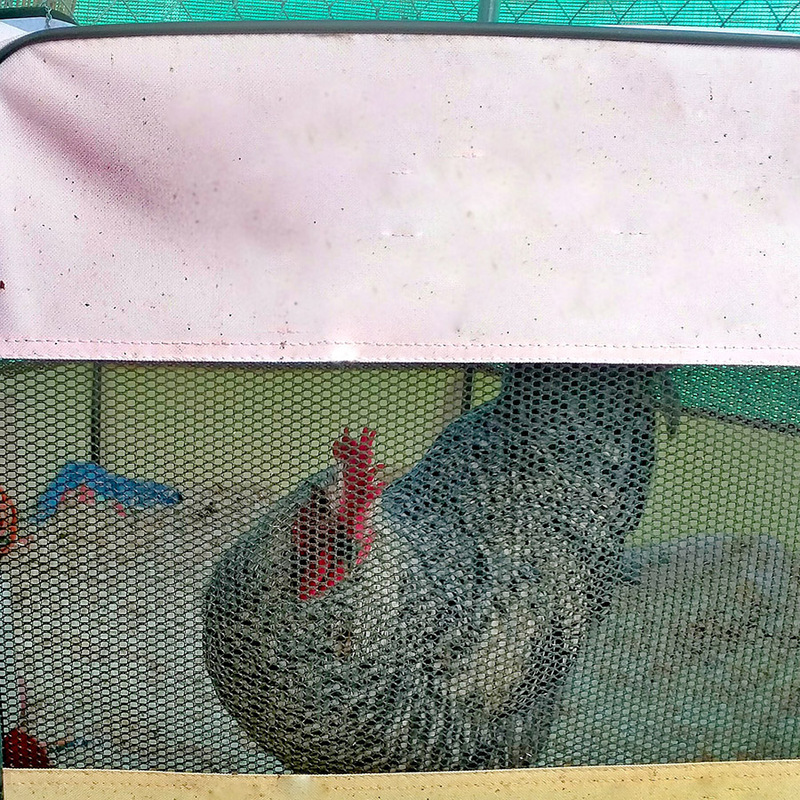 Until she knew what she was dealing with, Kelly didn’t want any additional stress on the foot, so she set Checkers up in a small recovery pen within the bird enclosure. The next day, Kelly inspected Checkers’ foot for any changes from the day before. It was slightly swollen and Checkers was still lame. She noticed that he would frequently stand on the non-injured foot while holding up the injured one. 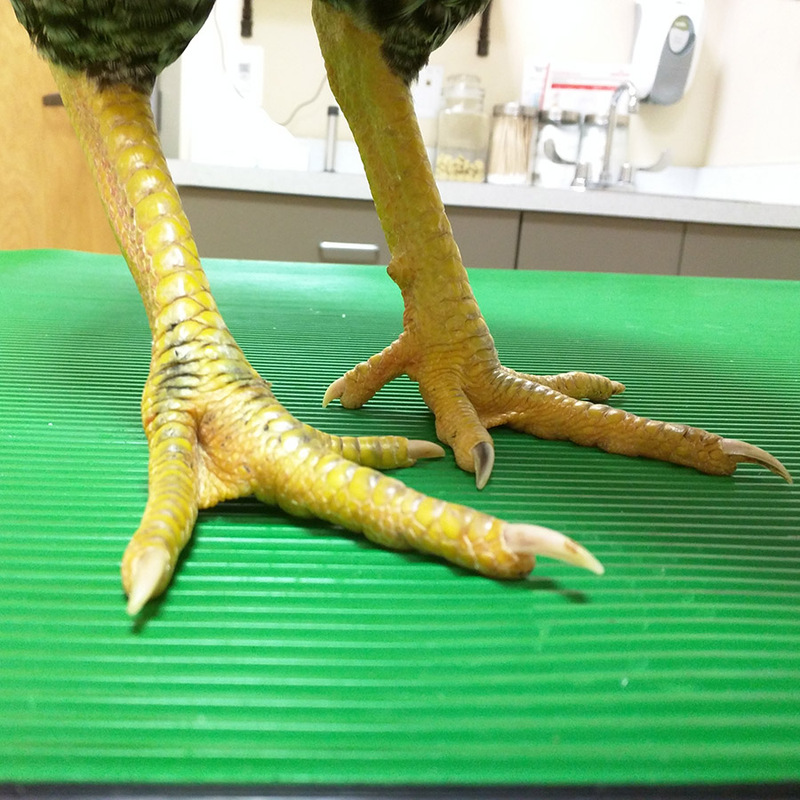 By the third day, some faint green discoloration (in chickens this is how they bruise) appeared on his foot. By the fourth day post injury, Checkers’ foot still had not gotten any better. 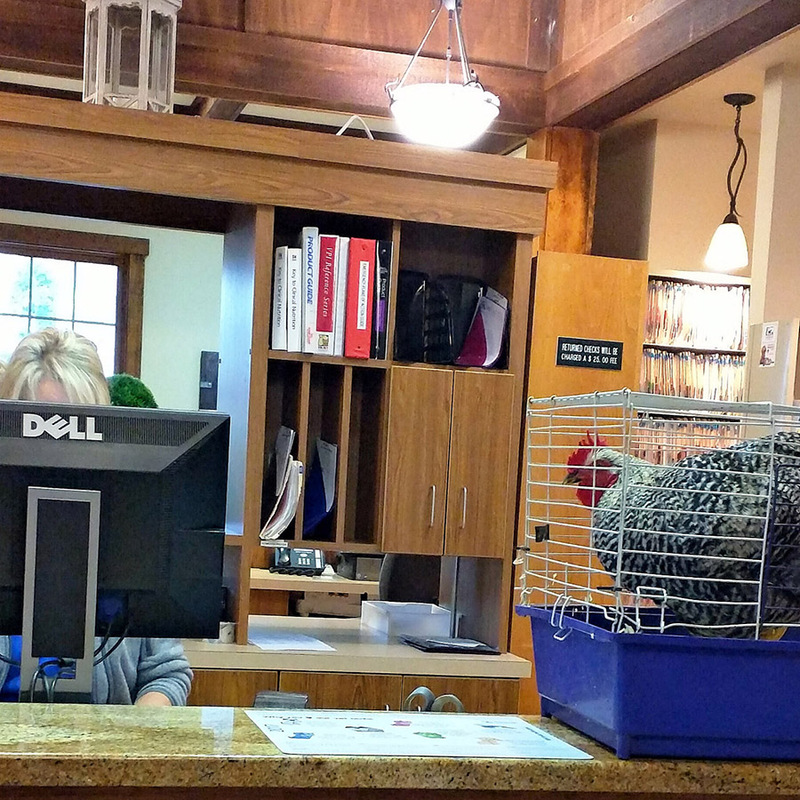 Kelly decided she needed to find a veterinarian nearby who would see him. 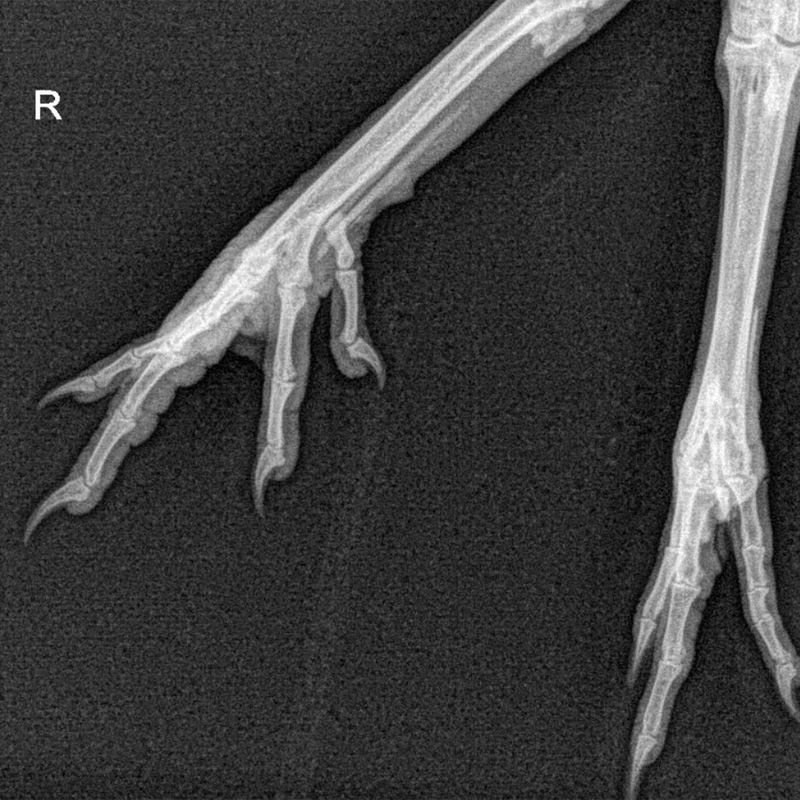 So she tried reaching out to several veterinarians in the area to see whether they would treat a chicken with an injured foot. 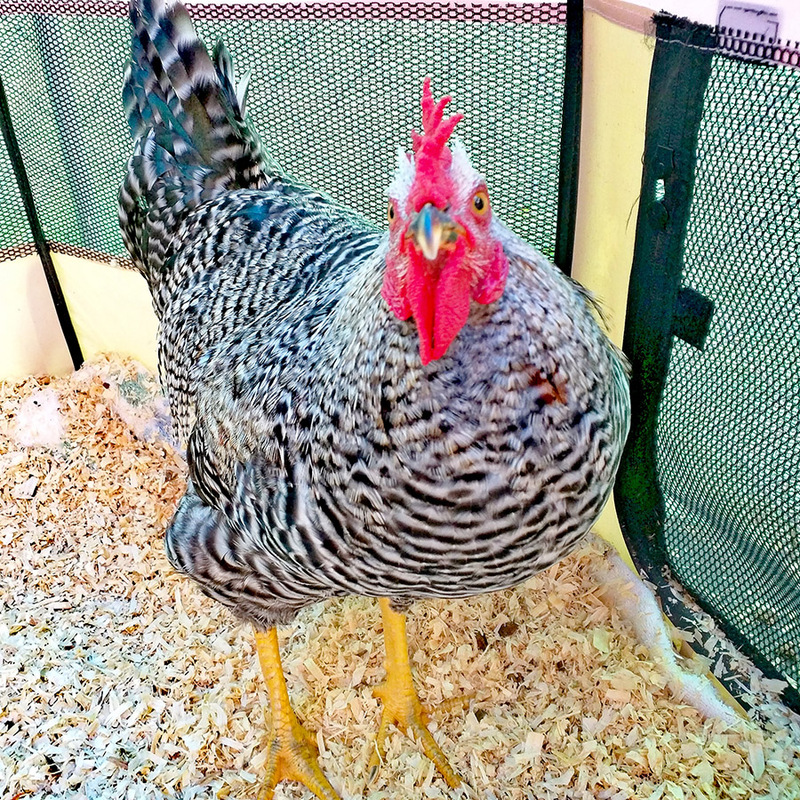 “Sorry, we don’t treat chickens,” was the common response to her inquiries. Marie called Leesburg Veterinary Hospital. The receptionist who answered the phone enthusiastically expressed how they would be happy to make an appointment for Checkers to see Dr. Michael Strickland. Marie arrived at the Leesburg Veterinary Hospital the following afternoon with Checkers. As she walked through the front doors with Checkers, she was cheerfully greeted by several of the hospital staff. 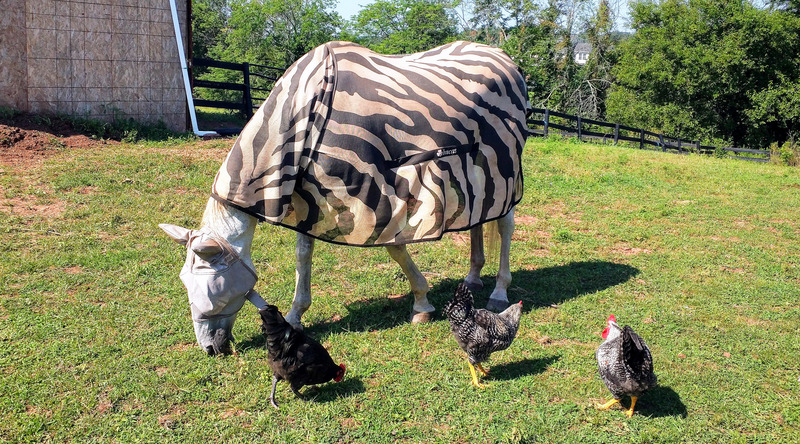 As soon as they realized who Checkers was---a rooster, they all came up to see him and say hello. Within two minutes of arrival, Kelly and Checkers were brought back into one of the examination room. Just as Kelly took Checkers out of his travel cage, Dr. Strickland had entered the room. He inquired about Checker’s history, circumstances leading to his injury, and what initial treatment Kelly may have performed prior to bring him to the hospital. 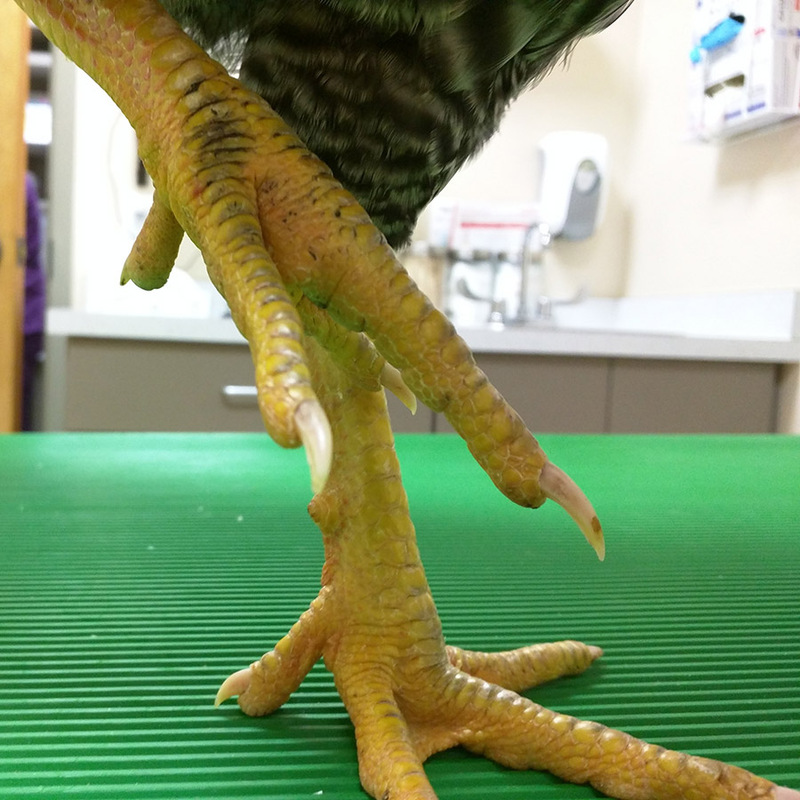 He performed a physical examination of Checker’s injured right foot, which had mild swelling of the Metatarsophalangeal joint. 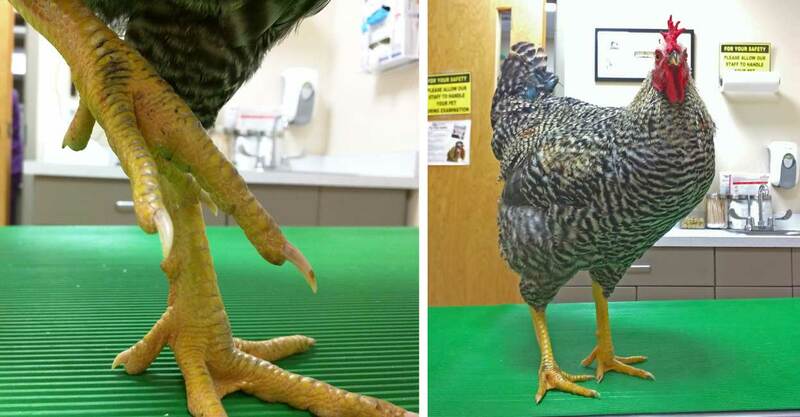 Next, he placed Checkers’ on the exam room floor to assess how he walked on the foot. 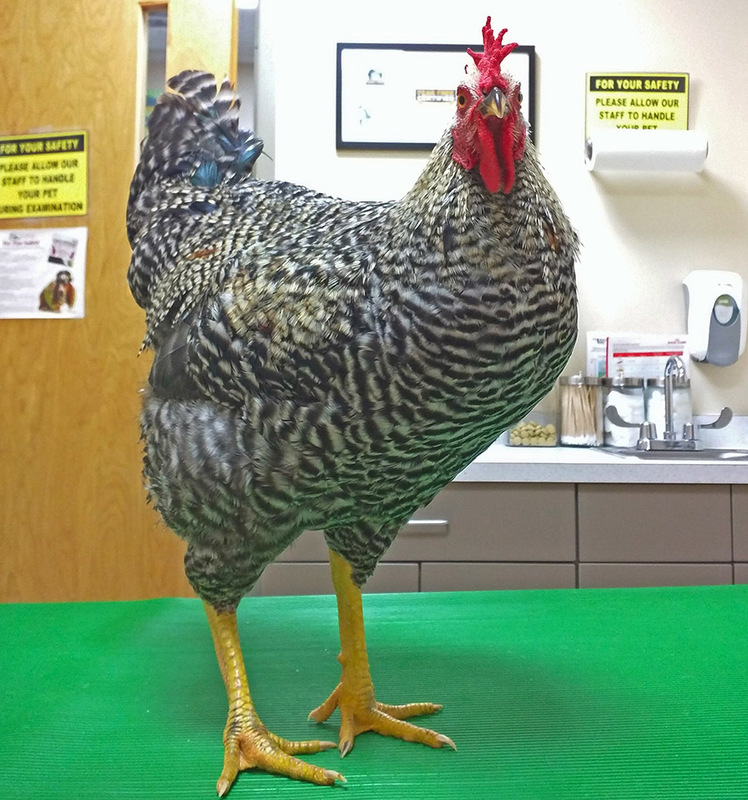 Upon observing Checkers at a walk, Dr. Strickland noticed the rooster was bearing about 70% of his weight on the foot---meaning that although it was painful for him to use it, any fracture that was present was probably minor. He explained that this meant his recommendations for treatment of the foot would likely be the same, with or without radiographs; however, the only way to confirm for sure the presence of a fracture was by taking radiographs. Kelly opted for the radiographs. 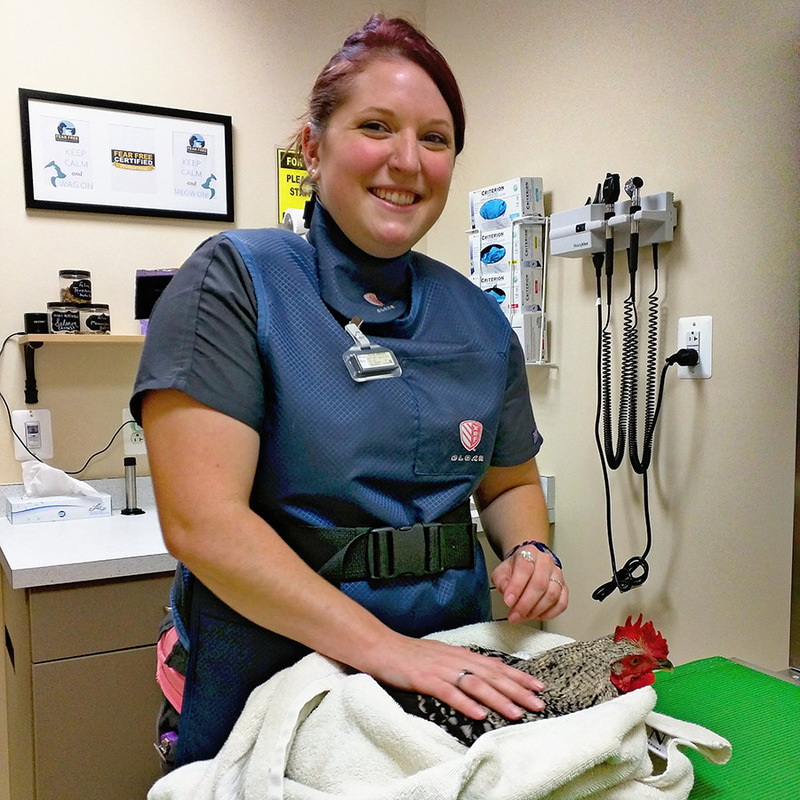 Nurse Olivia Armond came and gently collected Checkers and brought him into the radiology room. She was joined by another technician who both worked together to swiftly capture the appropriate angles of Checkers’ foot for Dr. Strickland to be able to assess the severity of his injury. They never had to administer any sedatives to Checkers. 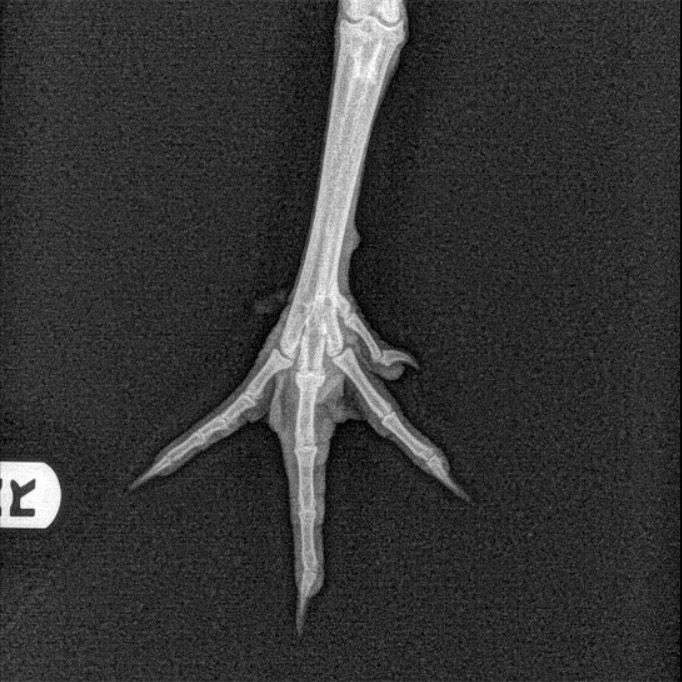 Once Dr. Strickland reviewed the radiographs, he informed Kelly that Checkers had a non-displaced fracture of the middle digit on the first phalange in his right foot. 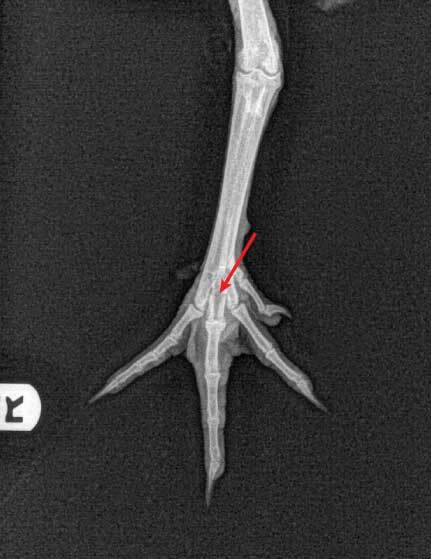 He also showed Kelly the radiograph and pointed out exactly where the fracture was located. 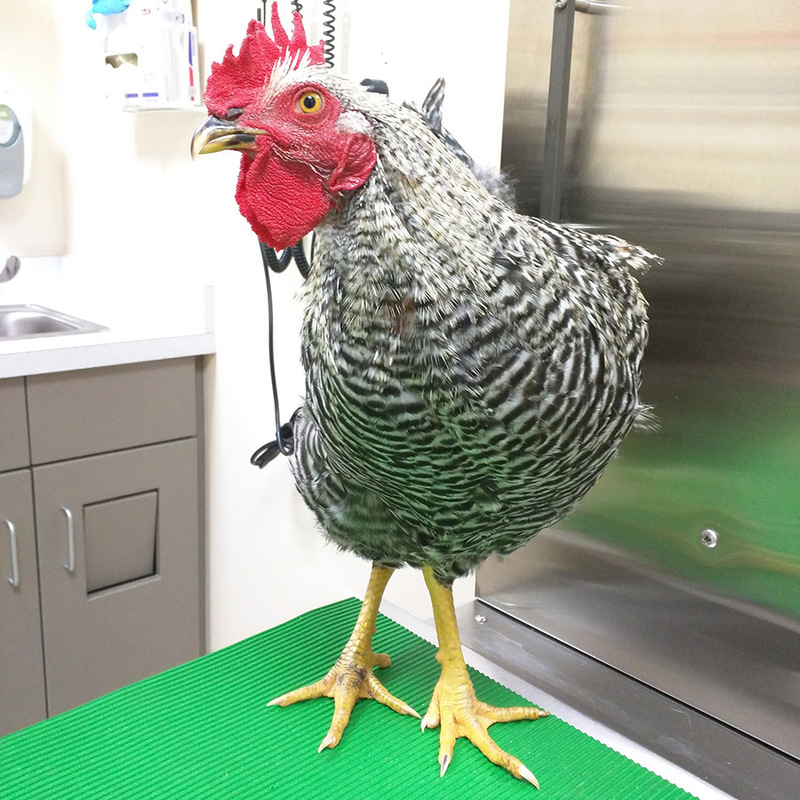 Dr. Strickland explained how that since it was a minor fracture, Checkers’ would be okay without a splint or bandage and that the lesion would likely heal in 2-3 weeks. Dr. Strickland recommended that Kelly continue to keep Checkers isolated in his recovery pen for the next 3 weeks. 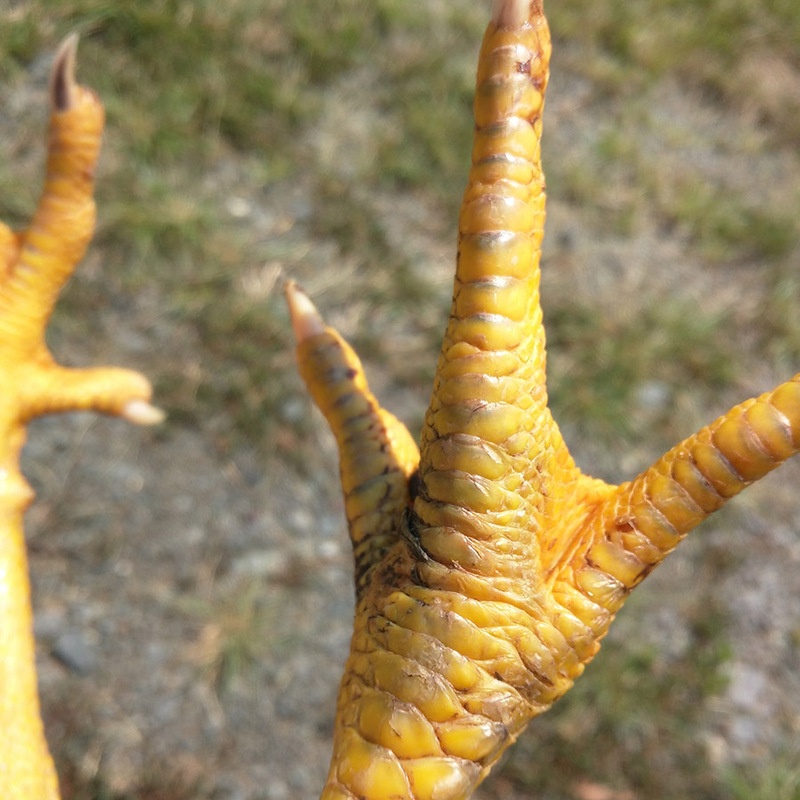 This would give his foot the time it needed to heal, and prevent him from getting chased by the other roosters, especially since he was lower in the pecking order. 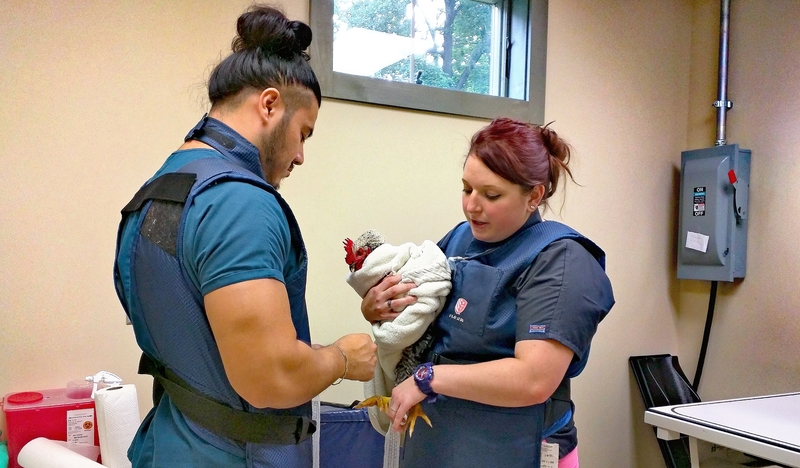 He also emphasized how it was very important that she maintain a clean environment for him inside the recovery pen, in order to help prevent any secondary infection in the foot. To help with any pain, Dr. Strickland gave Kelly five pre-dosed syringes of Metacam, a non-steroidal anti-inflammatory (NSAID) drug, to give to Checkers by mouth daily, for 3 consecutive days. After which, he recommended possibly giving him the remaining 2 doses as needed, or every other day thereafter. 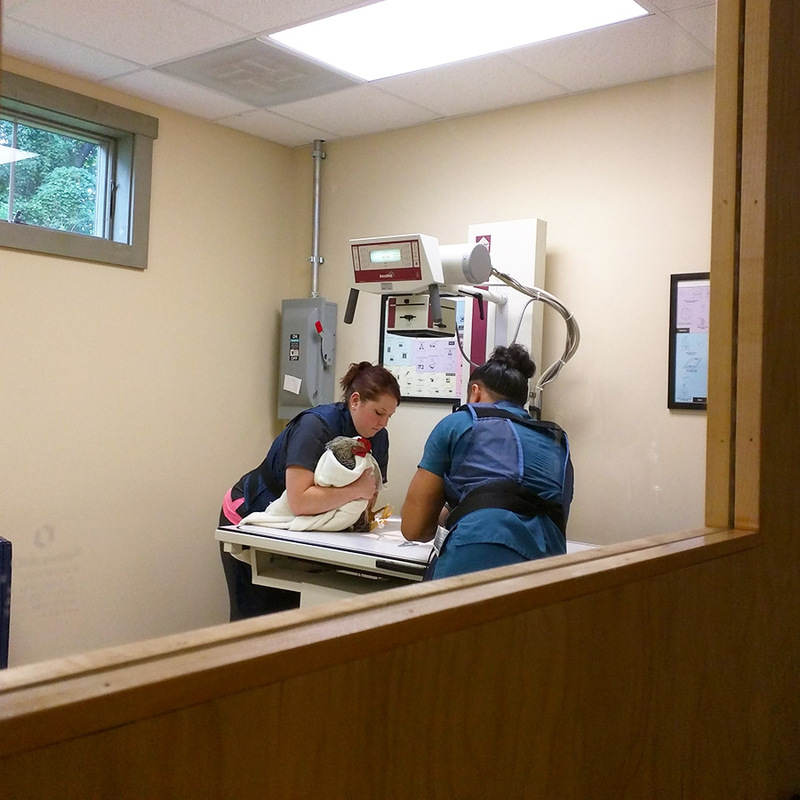 Kelly and Checkers were promptly checked out upon leaving the examination room. Kelly received an itemized invoice which included detailed written discharge instructions of what Dr. Strickland had discussed with her verbally during their appointment. One of the technicians informed her that they would be sending her an email with the radiographs shortly. 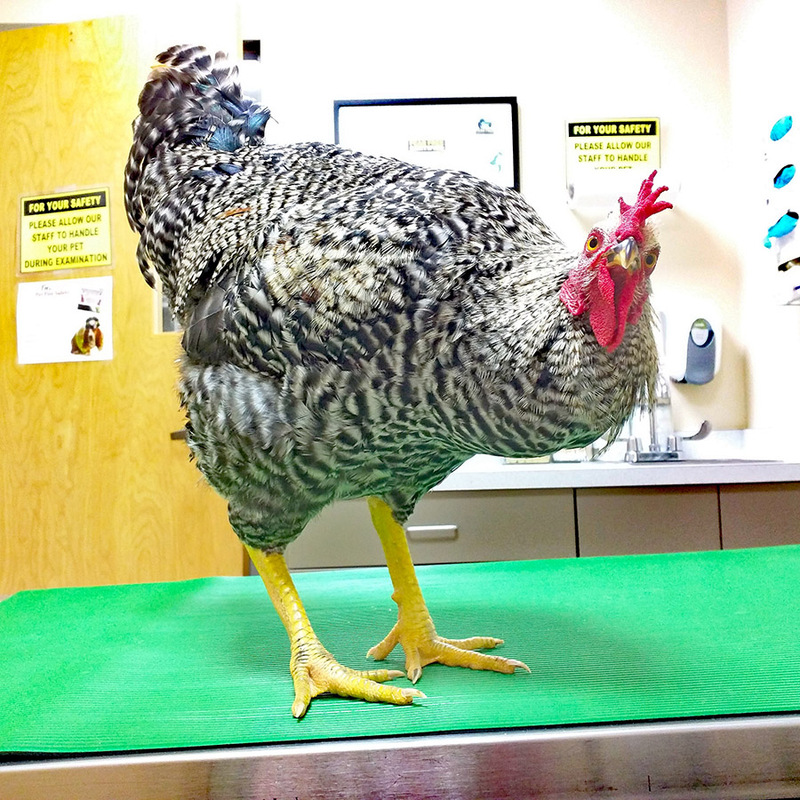 Within moments of leaving the hospital, Kelly received an email from Leesburg Veterinary Hospital with the link for her to access Checker’s radiograph images. When Kelly and Checkers arrived back at the barn, she gave him his first dose of his medication and placed him in the recovery pen. For the next 3 weeks she made sure to follow Dr. Strickland’s instructions for treatment of Checkers’ fractured foot. Moving forward, despite how cute she thought it was that Cash and the chickens were grazing together, Kelly plans to discourage the birds from doing this. 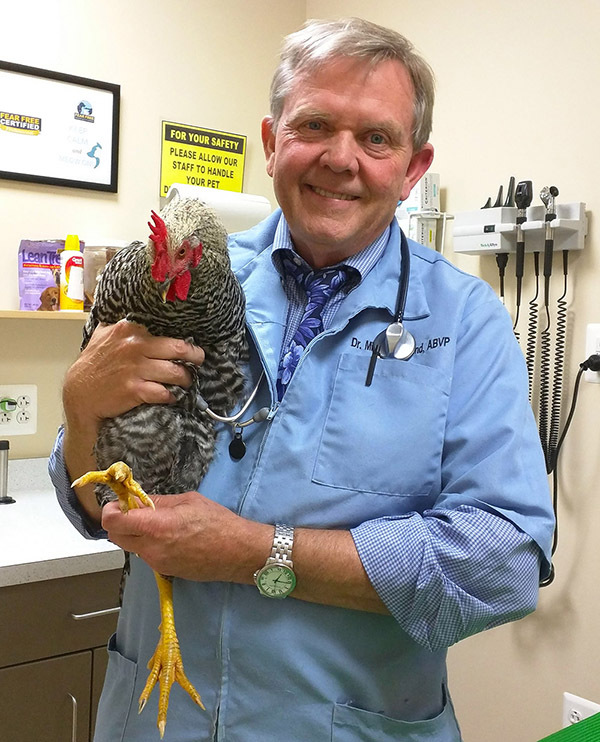 As a young boy growing up in Baltimore, MD, Dr. Michael Strickland knew animals were his passion. Moving to beautiful Loudoun County in 1984 he worked with Dr. Jack Howard, his mentor who owned the original Leesburg Veterinary Hospital for 40 years. Dr. Strickland’s dedication and integrity were modeled after Dr. Howards’, and he still continues to carry on the tradition of “Caring is what we do best” from one generation to the next. The practice was purchased by Dr. Strickland in 1985. 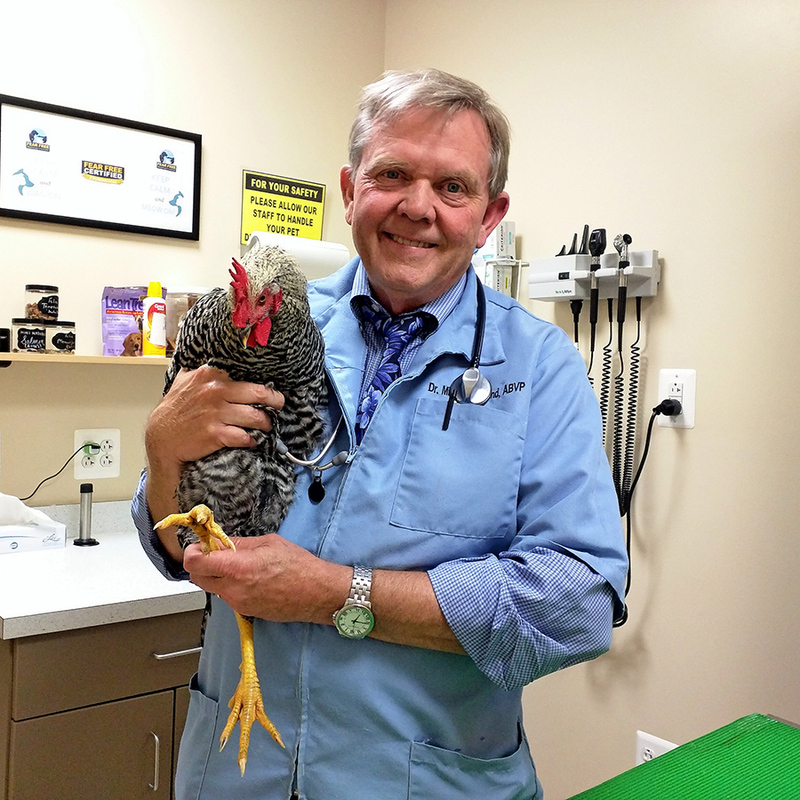 Moving to beautiful Loudoun County in 1984 he worked with Dr. Jack Howard, his mentor who owned the original Leesburg Veterinary Hospital for 40 years. Dr. Strickland’s dedication and integrity were modeled after Dr. Howards’, and he still continues to carry on the tradition of “Caring is what we do best” from one generation to the next. The practice was purchased by Dr. Strickland in 1985. To this day, Dr. Strickland said he enjoys "the variety of cases and meeting people and their pets". 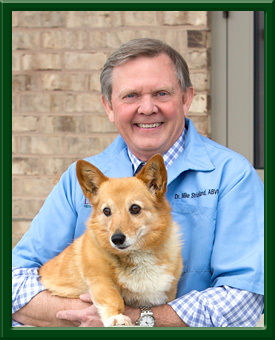 Dr. Strickland is a member of the American Veterinary Medical Association, the American Animal Hospital Association, the American Board of Veterinary Practitioners, and the Northern Virginia Veterinary Medical Association. He is also a troop leader for Boy Scout Troop 711 and a member of the Blue Ridge Bible Church. 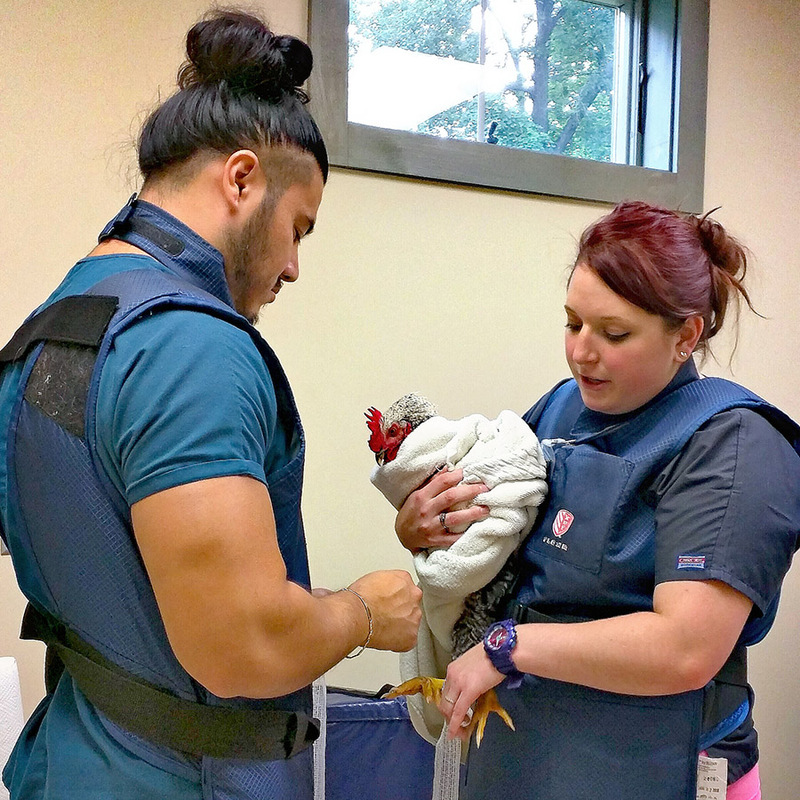 Leesburg Veterinary Hospital has been a prominent fixture in the Loudoun County community for almost thirty years. From 1985-2011, their practice was privileged to grow in downtown Leesburg, where they established a loyal client and patient following. 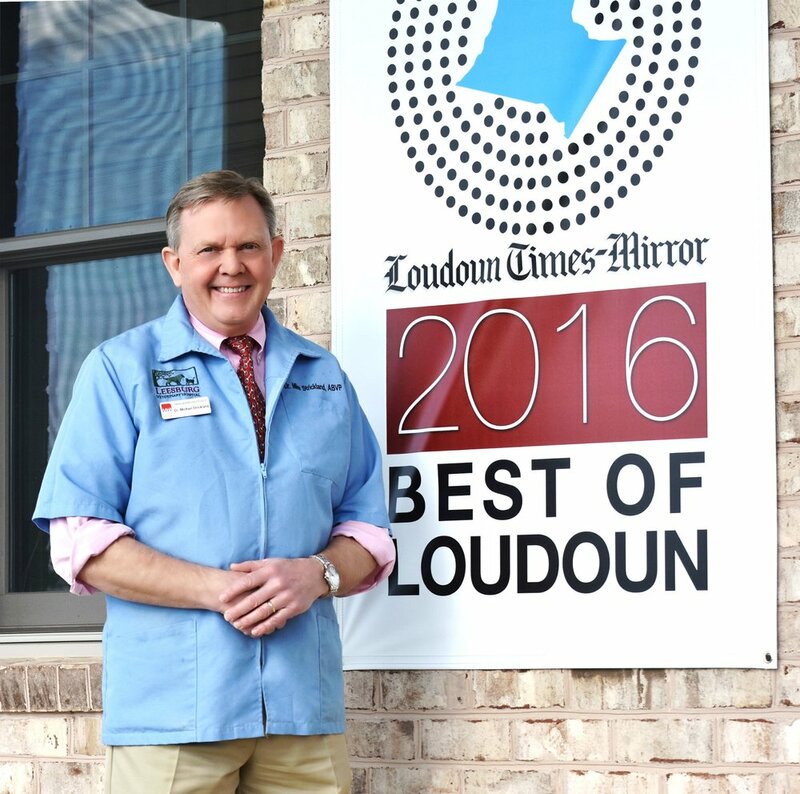 To best serve their patients, practice owner Dr. Michael Strickland envisioned and designed a new facility that would provide the highest standards of veterinary care while encompassing the true Loudoun County lifestyle. Since June 2011, they have been practicing out of a free-standing, state-of-the-art facility on Route 15, just south of town. A rustic and casual retreat, coupled with the best veterinary technology available, every inch of their new hospital was created with their clients and patients in mind.